Inner city Chicago is not the best place to hunt for grand Mid-Century architectural statements. 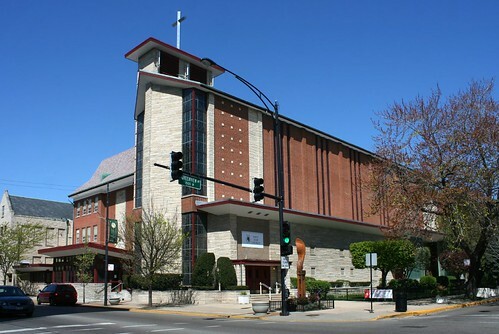 Nonetheless, at 1500 W. Belmont, just east of Ashland, you’ll find one of the region’s most fantastic post-war churches. 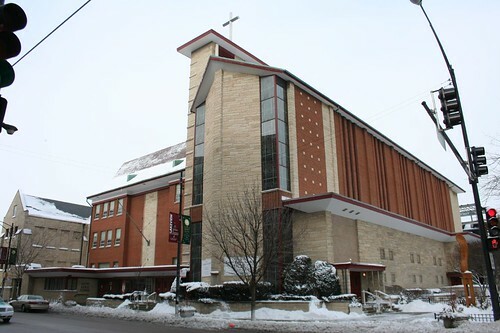 Ground was broken for the Evangelical Lutheran Church of St. Luke in April 1959 after two years of planning, and the building – designed by Chicago architect Charles A. Stahl – was dedicated in October 1960. 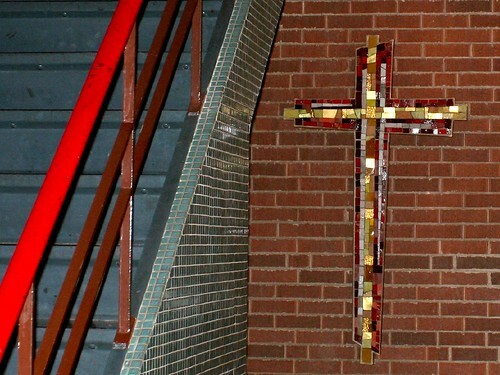 The St. Luke campus has a complicated history. The congregation has met at this location since its founding in 1884, originally in a fairly stock brick Gothic building with a central tower. 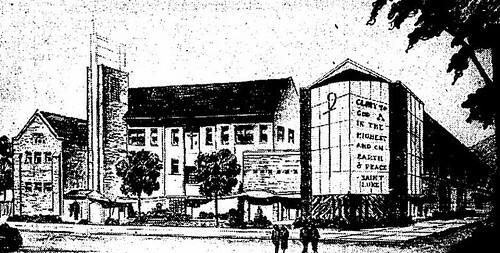 In 1905, a new school building was erected next door. Though the school building retained its original facade when the new sanctuary went up, subsequent additions and alterations have rendered it almost unrecognizable.1. 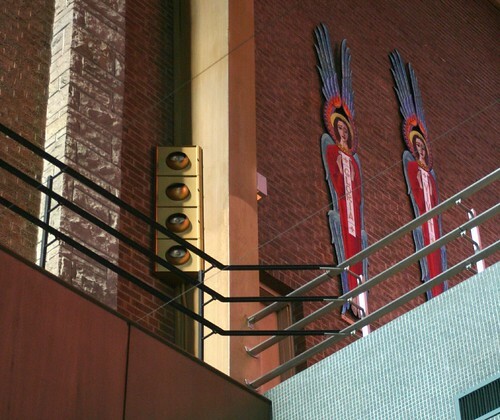 The 1950s church bears what might be a trace of Frank Lloyd Wright’s ubiquitous influence – but St. Luke is indisputably a vertical building – soaring as any Gothic cathedral, tall and narrow within. Long wood laminate beams rise straight up, turning at their top to support the shallow gabled ceiling. The choir loft is a balcony in the form of a bridge at the rear of the sanctuary, spanning between the walls and supported only on the sides. 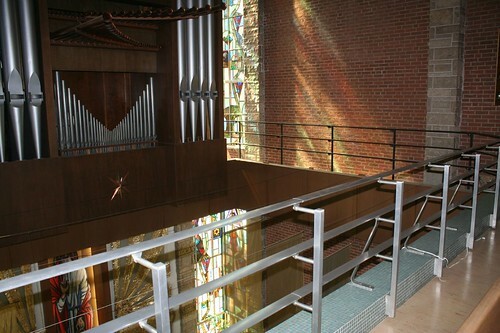 This enables the back of the sanctuary, behind the balcony, to function as a grand foyer, connected to the main space but somewhat separated from it as well. 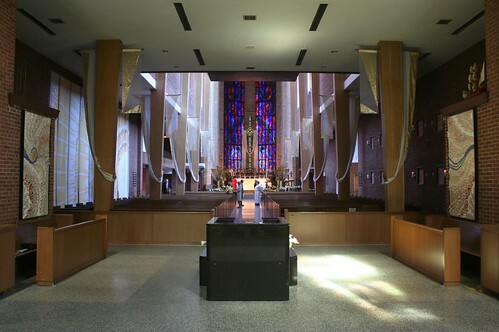 This foyer space is as tall as the main sanctuary. 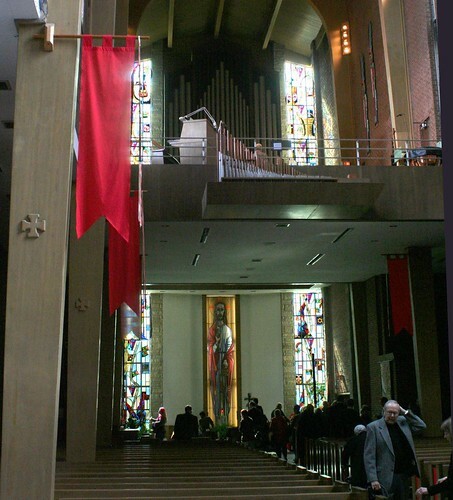 A second balcony functions as the children’s choir loft; it is a small room on the west side of the sanctuary overlooking the altar. 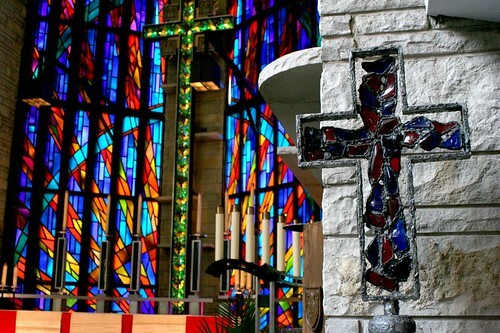 The Church of St. Luke is wonderfully artful – literally. 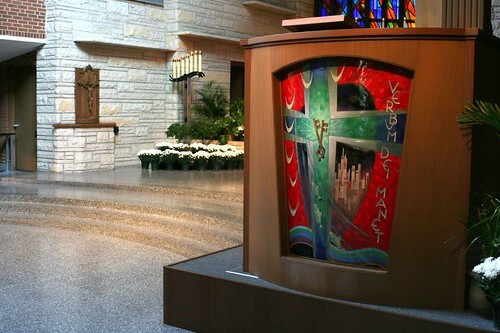 The congregation holds a substantial art collection – and the sanctuary features both permanent and seasonally rotating elements that complement and enhance the space. Some of the more permanent elements are shown below. 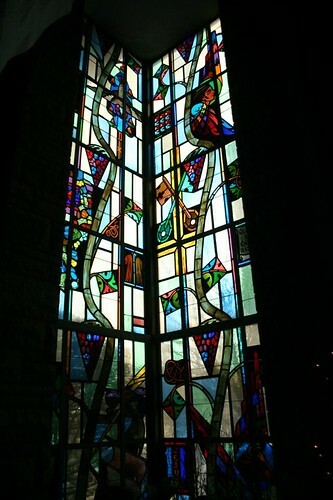 The stained glass is strategically concentrated. A grand burst of rising waves of color emerges from behind the altar at the head of the sanctuary, bringing the space to its dramatic climax. 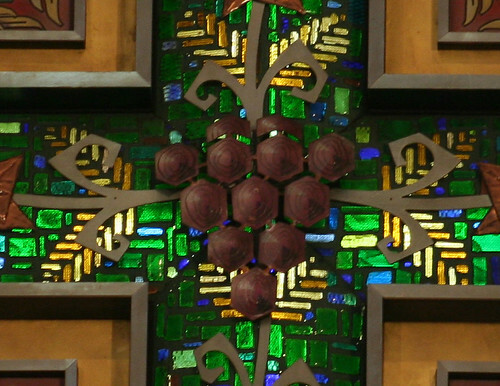 At the back of the church, facing south onto Belmont, the corners of the building are wrapped by tall, narrow windows with biblical and saintly symbols with two vines making their way sinuously skyward. 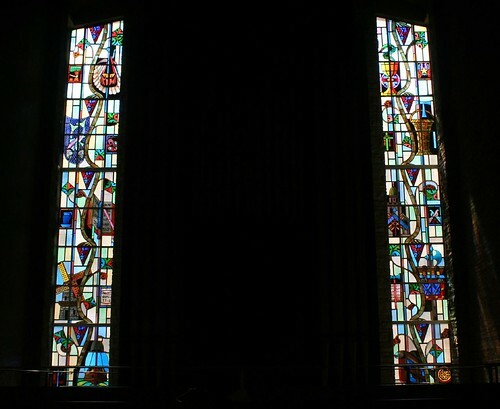 I have not found any notes on who designed or installed the stained glass – not even a signature. 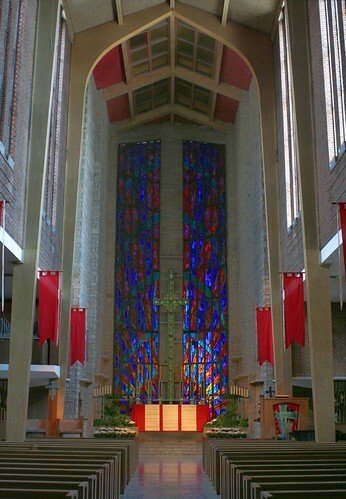 Between concept and execution, the tower was joined to the sanctuary (and now contains the stairwell leading to the balcony, as well as some dressing and storage rooms for the choir). The overall design became more sharply vertical, the materials of the shield wall in front changed from flat panels to rough-faced stone masonry, and the large text was dropped. 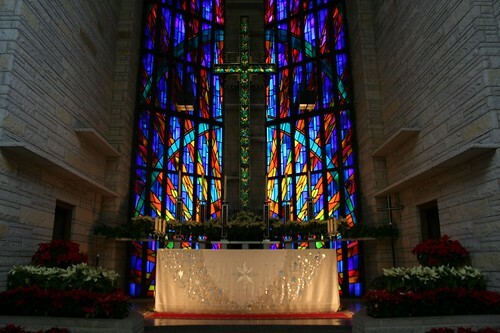 That's a fabulous church. 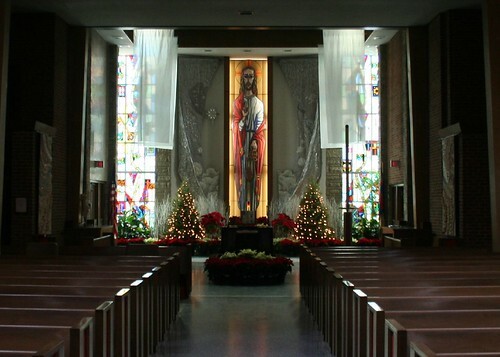 As a Catholic, I'm jealous….I wonder how the congregation is holding up. They seem like they're doing very well. They just added a small addition to the front of the school building, and each of the three times I've visited, the sanctuary was at least mostly full.